Fall is finally here! I want to jump for sweet cinnamon joy into a pile of freshly raked leaves. I bought a new flannel from Target a few weeks ago and have been waiting until yesterday to wear it. I also refused to get a Pumpkin Spice Latte until it was officially Fall, so yesterday was a great day, I wore my flannel and got a PSL. Now it’s time to get some new Fall decorations and impatiently wait for cooler weather. There are so many outfits I want to wear but it’s still too hot! Such a southern Cali struggle right? I want a scarf and knee high socks stat. 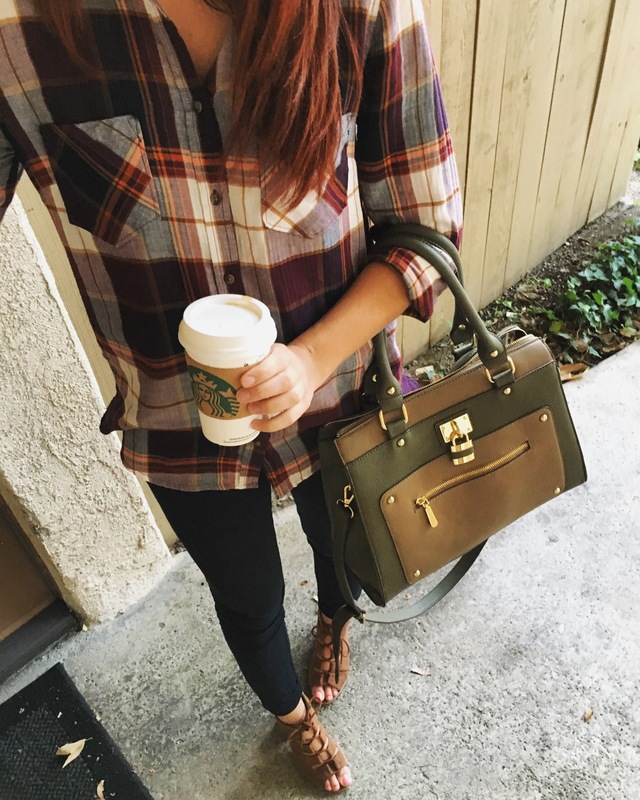 I am sooo in love with this flannel because the colors are perfect for this new season. I already have my next outfit planned for it too. Flannels are great because they are casual, yet you can dress them up for the office. Like yesterday I wore them with my navy Maison Jules skinny ankle slacks. You can also tuck them into high waist pants, and my personal favorite (that I didn’t do this time) is add a statement necklace under the collar. Also did you see my new heels again? See I told you I’d be wearing them a lot. Lastly this purse is amazing and perfect and was only like $30 from Charming Charlie. Check it out!